5 CHEAP Last Minute Valentine's Day Gifts! You are here: Home / DIY / 5 CHEAP Last Minute Valentine’s Day Gifts! 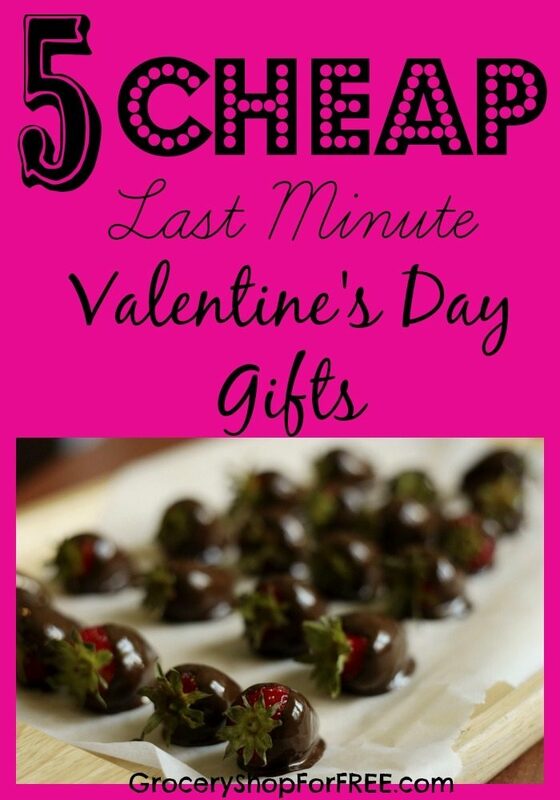 5 CHEAP Last Minute Valentine’s Day Gifts! We have all been there when suddenly it is the day of the big date or event and you have forgotten to pick up a gift yet don’t want to appear cheap or as if you have forgotten. Here are 5 CHEAP LAST MINUTE VALENTINE’S DAY GIFTS that will look like they came from the heart, weren’t rushed and will be meaningful to the receiver while not breaking your budget. WRITE A POEM AND FRAME IT: Nothing is more personal than poetry. If you have a knack for writing simply create a piece that is unique for the person you are giving to. If not, check out the literally hundreds of websites online full of love poetry and pick something that reminds you of your love. Framing wedding vows is also a beautiful tribute to your love. Type up the poem on a piece of parchment or specialty paper and print in an elegant script. Pick up a nice frame from your local craft store or retailer and personalize it with embellishments or simply choose a beautiful frame of quality wood to present it in. This can easily fit into any budget. GIVE THE GIFT OF TIME: Whether it be the offer of babysitting for your adult children, best friend or that single mom down the street or simply putting your book, laptop or phone down for the weekend and focusing on your love, giving the gift of your time is often the most rewarding gift around. This is especially true with our children. We often spend so much time working, commuting and running every direction to keep things going and our kids often would just love our dedicated time. Slip into their room and build a fort this weekend to play games in. Leave the phone on the charger and let them be the only focus in your life for a few hours or days. CREATE A MEMORY BOOK OR SCRAPBOOK: For a nominal amount of money you can pick up an empty photo album and print out pictures you have taken with your phone or digital camera and pick up at the nearest one hour photo location. Scrapbooking stickers and embellishments are inexpensive and come in various themes. Spend a few hours putting together a scrapbook of your love story or creating visual memories of your years spent together and cherished vacations. GO CLASSIC WITH FRUIT & CHOCOLATE: Nothing is more classic than strawberries and chocolate when it comes to Valentine’s Day. Ready made treats can be very expensive but a package of strawberries and melting chocolate is typically under $5. Hand dip the chocolates yourself and present with a candlelight meal as a surprise gift. MAKE A MIX TAPE: The popular gift of the 80’s has made a comback in the form of CD’s and playlist downloads. You can’t go wrong with creating a “mix tape” of your favorite songs that remind you of your love. Perfect for giving as a gift or uploading to their mp3 or Ipod. This is such a personal gift as you can include those intimate songs that remind you of your love, the playful songs and even the mysterious songs that make them think. Whatever you choose from this list of 5 cheap last minute valentine’s day gifts or something else that isn’t mentioned remember that Valentine’s Day is all about love. Take a moment to think about the person receiving your gift and what would make them feel love. Perhaps even spend a few moments thinking about what you know they have appreciated the most in the past and see if you can recreate those memories as well.